UHF Gen 2 RFID tags can be difficult to use in areas where there’s a lot of metal. 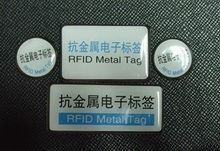 In order to aid the process, DAILY RFID has developed passive Gen 2 RFID Tag for metal surface, which can deliver a long range read on metal tagging even under harsh conditions. The RFID on-metal tag is designed for applications which require tags to be applied in metallic environment. Its unique construction enables the passive Gen 2 RFID tags to perform well in harsh environments, such as dipping in water and acid. The Gen 2 RFID tag for metal tagging is designed for worldwide deployment, with operating frequency customizable from 860MHz to 960MHz. It also has an read range up to 3 meters on metal basing on different RFID readers. The Passive Gen 2 RFID tag can easily be affixed to any metal surface either with its self-adhesive 3M Glue or mechanically with screw. Some small, fully encapsulated tags of the family have been successfully used in asset tracking applications such as railway and warehousing solutions.